My twin sister Lucy was the exact opposite to me in her approach to life – it’s like she was sprinkled with glittering fairy dust when she was a baby, whilst I just had dust chucked in my face. She only had to smile and she got the boyfriend, the engagement ring, the wedding, the perfect children – everything has been handed to her on a plate. But now, well, it’s become plain that my somewhat pessimistic approach to life has finally paid off, although please understand that I don’t find any satisfaction in vindication – honestly. 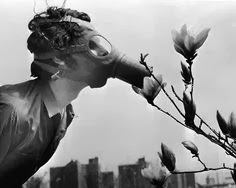 They warned us that the new species of magnolia had mutated, that poison lurked in its pollen and on no account should we even think about sniffing the flowers and their glorious, alluring scent. She couldn’t believe that something so beautiful could be a killer – those were her very, last words. Here’s my latest entry into VisDare this week, the prompt run by the lovely Angela. I have no idea where I got this tale of sinister tale of envy from… I’m not even feeling particularly dark today! Please do pop over to her blog and read the other submissions – no two will be alike! I enjoyed this, and especially the story veered quite subtlety towards its telling conclusion. You never know when the fortunate will get their comeuppance do you ? I try to be subtle… 🙂 Thank you! “No satisfaction, honestly”. Of course not. Love this.